A silky-textured lipstick with strong staying power for creating a perfect look - without drying out your lips! I want to order this product! This product smell good, color intence. Hi lipstick is smearing, and will not last on the lips very long. Very smooth on lips, well scented n very nice texture. highly recommended. This product tends to smear all over, you have to be carefull and always look in the mirror to make sure you do not have it on your face; leaves marks on every cup after drinking; smell is nice; tube looks a bit too big. Le bouchon n'est pas bien adapté car on met du rouge à lèvres dessus pour le refermer... De plus l'odeur à l'ouverture n'est vraiment pas agréable, trop chimique mais heureusement qu'elle ne reste pas sur les lèvres. Love the texture and color! Had fairly decent pigment, nice smell and did not make my lips dry. Was smooth when applying. Did not stay on well and rubbed off too easily. Was almos completely gone after taking two drinks from a glass. It did have a lot of feathering when i applied it. Would need to have a really good lip liner with it to keep it from bleeding out. 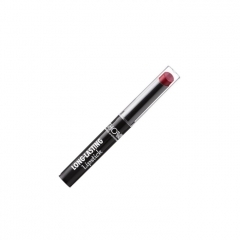 I loved it the size is perfect to last me a while the colour stands out and the moisture of the lipstick makes my lips soft love it. It matches me and i dont usually wear lipsticks but i fell in love with this one also the smell is very similiar to the smell of candy which i also liked about the product too. My perfect shade and it smells amazing. The smell was amazing. It was very pigmented. The color was beautiful. However, it transferred a lot and didn't last more than a couple hours of wear.